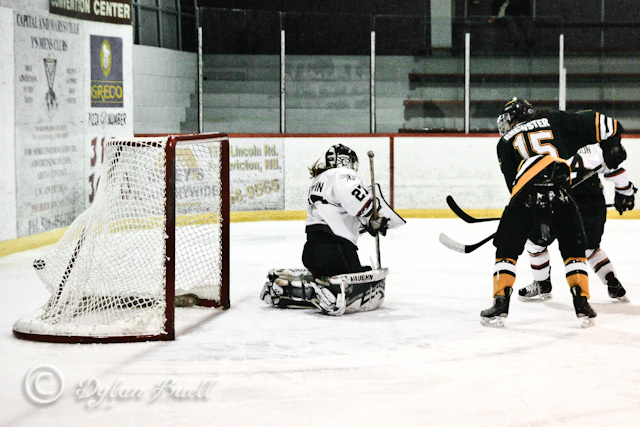 Katie Brewster's deflection goal at 9:17 of the first. The Lady Tommies finished up a four point weekend with a 4 - 2 win over the UPEI Panthers this afternoon at the LBR. With yesterdays big win over Moncton and today's victory, the suddenly surging Tommies sit three point back of UPEI for third position in the AUS with a game in hand. Today, a strong first period was enough to keep UPEI at bay. The Panthers struck first on the powerplay at 4:05 getting one past a screened Julia Sharun. The Tommies would respond with three straight powerplay goals of their own. Katie Brewster (Fox, Blackmore) would get a nice goal off a deflection at 9:17. Fifty-three seconds later Cassidy McTaggart (Brewster, Scott) would pot her fourth of the season at 10:10. Kayla Blackmore (Fox) would score the eventual game winner at 16:36 on a two man advantage. Shots favoured STU 16 - 10 in the period. The second period was all UPEI despite the Tommies having several power plays. UPEI cut the lead at 9:09 to make it 3 - 2. STU didn't register a shot on goal until the 17:08 mark and were out shot by a whooping 15 - 2 margin in the middle stanza. St. Thomas was able to right the ship in the third and contained UPEI to many perimeter shots that Julia Sharun handled with ease. Kayla Blackmore (D. Miller) scored a highlight reel breakaway goal at 14:28 for a little cushion and ultimately close out the scoring. Final shots on goal were 39 to 26 for UPEI. The Tommies next game is this Saturday afternoon against first place St-FX.